After almost two years, I think I realized that this is my life. 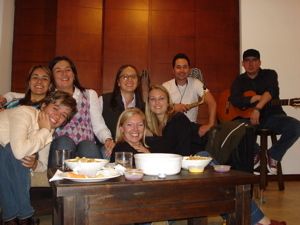 All it took was a house full of my Colombian friends, some live music, and not feeling the least little bit weird about it. Yes, that’s a man with a saxophone in my house and lawdy, could he play. And here’s the guitar guy. He could play, too, but unfortunately gave off the macho Latino I-want-to-touch-your-blond-hair vibe and he sweated a lot. I’m just sayin’. Love you, Ames, and wish you were here. I wish I was there with you, too. I could die for all that Colombian music. btw, you look hot! Tell all them ladies I say what up. Oh, so they really do have those macho, sweaty guys everywhere…not just in the US!!! I guess men are men no matter what continent they live on! How fun was that! You looked like you were having way too much fun.